Tamil Nadu farmers have submitted a memorandum to Chief Justice of India (CJI) Khehar demanding his intervention in protests, seeking relief for the drought-hit state. 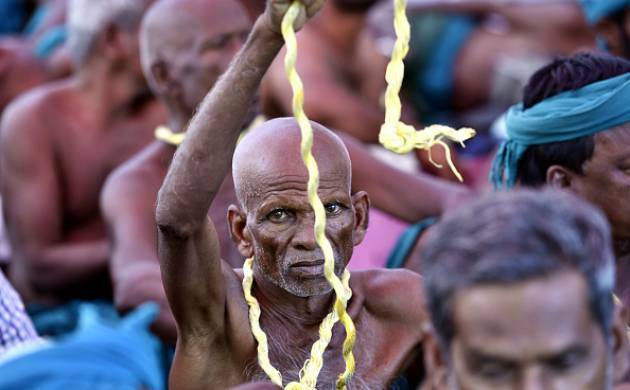 The farmers have been protesting in the national capital demanding a Rs-40,000 crore drought relief package from the Centre for Tamil Nadu, loan waiver, among others for last ten days. The memorandum submitted to the CJI’s office sought “suo motu” action by the apex court to mitigate sufferings of the farmers of the drought-hit state. The half-naked farmers also marched from the Supreme Court to Jantar Mantar shouting slogans demanding the Narendra Modi-led central government to look into their issues. On March 21, representatives of the farmers met Union Finance Minister Arun Jaitley and put forth their demands.